The various crises in housing in Ireland has been a constant focus of the media since the start of the crash. First, it was plunging house prices, developers going bust, construction workers losing their jobs, and the collapsing of PPPs. Then it was NAMA, vacancy, unfinished estates, pyrite-infected homes, Priory Hall and other poorly built estates, negative equity, and mortgage arrears. Now it is rising rents, rising prices in Dublin, a shortage of homes in some locations, social housing waiting lists, rising homelessness, and probably from this summer on increasing numbers of repossessions. Since 2007, all elements of housing, in all parts of the country, have been in crisis. For seven years we have effectively had no housing policy, no housing reforms, and no strong, proactive management designed to address the various problems. Rather, the government’s strategy under both the last regime and the present has been to tinker round the edges — site resolution plans, social and housing leasing initiative, a pyrite committee, minor reform to the Planning and Development Act, etc. None of it in a coordinated, holistic way. With the exception of putting millions into NAMA to look after the banker and developer interests in an effort to try and salvage something from the disastrous bank guarantee , these are all low cost, minimal effort tactics to give the impression of doing something, but actually toothless and spineless and making very little difference on the ground. They were shamed into sorting of the mess relating to Priory Hall residents. There has been no substantive investment in tackling various issues such as the 89,872 on the social housing waiting list, or the 96,474 in 90+ days in mortgage arrears, or rising homelessness. Investing in housing has not even to date been seen as a means of tackling two birds with one stone — creating jobs/investment in business and addressing various housing crises. Instead there has been massive disinvestment. For example, since 2008, the capital expenditure for social housing has been reduced by 80% (from €1.3bn to €275m) while there has been a 90% decrease in housing output from local authorities between 2007 and 2011. The strategy in effect has been to try and muddle through to such times as the private sector and the market return to sort things out. At which point any state investment will be targeted at reviving market interests, with social housing continuing to be supplied through private development and rental supplement. In 2010, 97,260 families received rent supplement allowance to enable them to live in private rental stock due to a lack of social housing at a cost to the state of over €500 million per annum. In whose interest is such a policy? It is difficult to argue, unless you are a vested private interest, that it is the state’s or taxpayers’. We will continue to have housing problems for a good number of years, especially in the absence of any holistic strategy and set of policies designed to try and coordinate and regulate development and how all aspects of the housing sector functions. That strategy needs to see good, affordable housing as a right; to see housing as homes rather than simply assets and investment vehicles. And it needs to get value for money for the state in terms of private services rendered. That’s not to deny market interests’ profit, but that this profit is reasonable without being exploitative and does not rip-off both tenants and the state. Much of continental Europe manages to do this. Ireland, however, has swallowed the neoliberal mantra hook, line and sinker, and seven years of crisis has not led to any kind of re-think or change in vision or policy. As the market returns and house and rental prices rise, in the absence of checks-and-balances such as rental control and adequate supply, affordability and the need for social housing and homelessness will increasingly become an issue, especially if local authorities remain emancipated of resources. House prices turning and rents rising does not mean that that various problems of housing in Ireland are soon to be solved. They signal the arrival of the next wave of issues. Expect on-going housing crises for the foreseeable future. Readers of this blog might be interested in Rory Hearne’s new book, the first published in the new ‘Irish Society’ series of Manchester University Press. Public private partnerships in Ireland: Failed experiment or the way forward for the state? Public Private Partnerships (PPPs) have come to public attention in recent years in Ireland with the impact of toll roads, the collapse of social-housing projects and their use in the provision of schools, water/waste water treatment plants, hospitals, light rail and other public infrastructure and services. 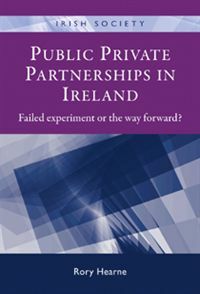 This book provides a ground breaking and unique analysis of the development of such PPPs internationally, with a detailed focus on the rationale behind their introduction and outcomes in Ireland. The detailed evidence outlined from the author’s extensive research (including interviews with senior central and government officials, private sector, community and trade union representatives and the Irish Minister for Environment) highlights the important role PPPs are playing in the implementation of privatisation and neoliberalism. The book also provides considerable practical lessons from individual PPP projects. It is therefore an essential read for students, academics of politics, economics, sociology, geography and policy practitioners in Ireland, and further afield. It is of considerable interest to anyone concerned with the progress of Irish society, its economy and public services and governance internationally. We’ve had ghost estates and zombie hotels. Now it seems we have phantom roads. Well at least under-utilised roads. This wouldn’t be too bad in the sense that a nice open road is more pleasant to drive on that one that’s chockerblock, but the problem is that these are PPP toll roads that require a certain level of usage otherwise payment penalties kick in. Plan Better – a joint initiative of An Taisce, Friends of the Earth, Friends of the Irish Environment and Feasta – have published data that shows that M3 traffic (21,500 per day) is 22% below the penalty payments level (26,250) and the Limerick Tunnel (13,500 per day) is 26% below the penalty payments level (17,000) on the Limerick Tunnel. If these traffic levels were to persist then over the lifetime of the PPP contracts the state (i.e. taxpayers) would owe the toll operators over €100m. Plan Better make a case that the NRA has made a fundamental mistake in applying a growth only model of traffic demand on the Irish roads network and they’re calling for a review of the projections used to justify future road building including the proposed motorway between Oilgate and Rosslare (N11/N25), and upgrades to routes such as Blarney to Patrickswell (N20), Clontribret to Moybridge (N2), the Ballyvourney motorway (N22), Abbeyfeale to Clonshire (N21), Kilmeaden to Midleton (N25), Ashbourne to Ardee (N2), and Tuam to Letterkenny (N17). Of course, we would expect traffic to fall off during a recession and to pick back up again as the economy recovers, but on the basis of Plan Better’s analysis it does seem like a recalibration of the models used to justify road building might be due given the drastic changes to Ireland’s economy in the past couple of years, especially given the pitfalls of PPP penalties and the pressure to reduce capital spend. It might well be the case that we need upgraded roads, but we have little need for gold-plated phantom ones (see also this post on Irish Economy).